frequencies tested. It may be used to calculate the amount of hearing handicap a person has. behavioral testing or by using tone pips to generate auditory brainstem responses. vision test. In the audiogram, the goal is to determine the lowest signal level a person can hear. luminosity light of various colors, red to blue, that can be seen. during day-to-day life are people presented with perceptual tasks of similar demand. exposed to noise levels of 85 dB(A) LAeq,8h will develop hearing impairment over their lives. 8.1 for a listing of ANSI standards and comparable ISO and IEC standards. OSHA, is referred to as monitoring audiometry for the purposes of compliance. workers exposed to noise levels at or above 85 dB(A) LAeq,8h receive audiometry. (NIOSH 1996). exposure levels are equal to or greater than 100 dB(A) LAeq,8h. fitting and use of hearing protectors. threshold shift, and thus prevents hearing loss due to noise exposure. under which the test is administered. present in the test environment. ANSI S3.1-1991 are displayed in Table 8.2. Accordance with ANSI S3.1-1991, OSHA table D-2 (1981), and OSHA table D-1 (1983). switching to the levels from ANSI S3.1-1991 with a 5 dB adjustment at 500 Hz (OSHA 1981). After successive stays and issuances of the regulation, only the levels in Table 8.2 remain. unnecessary noise generating activities in the area of the test room. with the typical floor plans..
back on an airplane for transport to the next airport where testing was to be done. Figure 8.1. A typical “mini” sound booth. allow bone conduction testing with unoccluded ears as is specified in ANSI S3.1-1991. from the floor, the vibration isolators should also be replaced every four to five years. multiple-station test booths are often built into trailers or trucks. completed the test remain seated and quiet while others are finishing. behaviors when multiple-person test booths are used. kilograms or higher. Typical noise reductions for a double-walled room is shown in Table 8.3.
cushion, the MX41/AR cushion has many leaks and is not a good attenuator of external sounds. may be easier to mount the sound level meter on a tripod than to hold it while taking readings. say that hearing thresholds of less than 10 dB HL at 1000 Hz were unreliable. is tested. There are various testing methods and instrument types for determining these levels. hearing due to noise exposure. frequency and records it on an audiogram chart or table. setting is recorded as threshold. recorded as threshold. Figure 8.3 displays a flow chart for administering the modified HughsonWestlake procedure (after Martin, 1986). much more difficult to assign threshold to any intensity. OSHA Hearing Conservation Amendment (OSHA 1983) does not require testing at 8000 Hz. from hearing loss due to some other cause. be used if the audiometer has the feature. the worse/left ear since the retest is a confirmation that the listener is responding consistently. Once that is determined, it is not necessary to reconfirm it. symbols should be aligned at the 5 dB points. axis) corresponds to the same distance represented by a 20 dB range on the ordinate (y axis). Frequency is plotted logarithmically so that there is equal distance between the octaves. level for competing brands of audiometers. Figure 8.4. Typical graphic audiogram. over a 20 to 40-year range. Table 8.4. Tabular audiogram. Hearing thresholds are entered for each frequency. be relevant to the hearing test. This applies to both graphic and tabular audiograms. own method after a time. This alone will introduce error into the audiogram. and the point of releasing the switch. Figure 8.5. Self recording, Békésy, audiometer. the same time. OSHA requires that self-recording audiometers to present a pulsing 200 msecduration tone with a 50% duty cycle (200 msec on, 200 msec off) (OSHA 1983). tool to explain the test results to the listener. it is not practical to stop testing for one person, so the test would be allowed to continue. excursions of no less than 3 dB and no wider than 13 dB. The chart for the worse/left ear shows some examples of unacceptable tracings. instruction and is pressing and releasing the button without regard to the tones. tracings this wide, it is impossible to determine where threshold is. audibility/inaudibility so quickly when the attenuation rate is 5 dB/second. is still audible, presses the button again, and so on. reinstructed and testing should be started over. the threshold shall be the average of the midpoints of the tracing excursions. occupational hearing loss prevention purposes are minimal. significant threshold shift since the baseline audiogram. be relevant to the hearing test. audiograms with unscoreable tracings could become the permanent record. and retested. Of those about half will not be able to provide acceptable tracings for the retest. Those persons must be tested some other way, such as with a manual audiometer. necessary to have access to consumable supplies such as audiogram cards and marking pens. Without the proper card or pen, the unit can’t be used. calculations not related directly to obtaining a hearing test. the completion of the test perform the calculation for significant threshold shift. through menu items seen on the audiometer’s display panel, and performing manual audiometry. direct the output of the audiogram to a printer or to a computer. moving parts other than a printer, if included, it is more rugged than a self-recording audiometer. process easier for the listeners. once manual audiometry has started, requiring the rest of the test to be performed manually. useful for calculating significant threshold shift and percent hearing handicap may also appear. the results of his or her test. Figure 8.8. Microprocessor audiogram printout. audiometers may be started at once. whose hearing tests are not complicated. communication, so it is not possible for the listener to tell the tester what the problem may be. why differences occur between audiometer types. fluctuation in the subjective criterion of audibility by the subject. Many of these error sources can be minimized by careful control of the testing environment. providing a means of managing the day-to-day calibration check of the audiometer. not have an effect on the audiogram. An alert tester can also reduce error due to tinnitus and obstruction of the ear canal. test. Earmuffs or other forms of hearing protection should not be used to obtain the quiet period. audible often using a loudness rather than a threshold criterion, presents a difficult challenge. Most listeners will not conceive of “cheating” on a hearing test by not following the instructions. of this chapter as they involve more than pure-tone air-conduction audiometry. there should be no difference between manual and Békésy methods. 5 dB HL, 5 dB less than the 10 dB HL threshold from manual audiometry for the same person. audiometry. This is consistent with the findings of Harris (1980). threshold of hearing than would be obtained with manual audiometry. 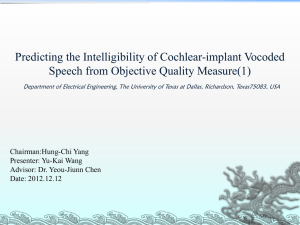 differences of 3.5 dB could be demonstrated just by changing the instructions to the listener. release the response button when a tone was thought to have been heard. A functional check is just that, a check to make sure the audiometer’s functions are operative. ears, and work with the response switch without introducing distortions, clicks, and drop outs. Most audiometer manufacturers will provide a guide for performing a functional check. Set the audiometer to 70 dB HTL, 1000 Hz, output to right ear. either automatically or by repeated pressing the presentation switch. click at the beginning or end of the tone pulse. Switch the signal from right to left ear. The tones should be equally as loud. the press or release of the button. tone should not seem to ramp up or down in frequency. calibrated before it is used. the place of the person with known hearing. designed to accept the full-size MX41/AR cushion and earphone mounted on the headband. switch and indicator lamp as well as with a Békésy or microprocessor-controlled audiometer . calibration as they will not drift. and document test room ambient noise levels. Appendix D, Table D-1 (see Table 8.2) rather than those of ANSI S3.1-1996 for ears covered. Association for mobile test vans (NHCA 1996). to take the audiometer out of service and use a sound level meter to determine its output levels. having to ship the unit for calibration which alone can have effects on the outcome. on successive placements and adjustments. parts: sound pressure output check, linearity check, and tolerances. Place the earphone on the coupler as described in Section 8.4.3.1.1. Set the audiometer’s hearing threshold level (HTL) dial to 70 dB. through 8000 Hz for each earphone. sound level meter octave band filter to 1000 Hz. 10 dB, noting the sound level meter reading at each setting. indicate a corresponding 10 dB decrease. earphone that is picking up environmental sounds. HTL have a corresponding change in sound pressure level of ± 1.5 dB. equipment, and who may adjust the audiometer to bring it back into calibration where necessary. audiometer to obtain new reference levels. calibration must be made before the audiometer may be placed back into service. of workers identified as having a significant threshold shift. only Texas licenses audiometer calibration technicians who are required to pass an examination. encountered during shipment, the likelihood that correct procedures will be used is good. little protection level against the claim if it should reach litigation. Shift is documented and subsequent follow-up actions commence. employees to prevent further hearing loss. 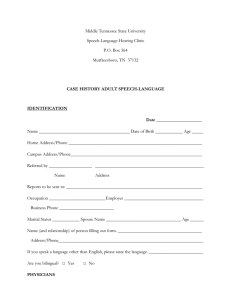 advice should also be given to a person to be seen for a baseline audiogram as part of a preemployment evaluation. has no similar requirement or recommendation. impossible to manage properly in most cases. to 15 months after the previous audiogram. the shift on the immediate retest. 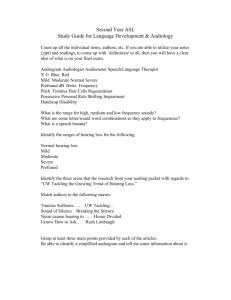 reference audiogram (revised baseline audiogram) at the time of the next periodic audiogram. 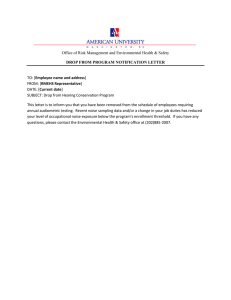 hearing loss on the OSHA Form 300 log or similar form. at the termination of exposure to workplace noise for this employment situation. 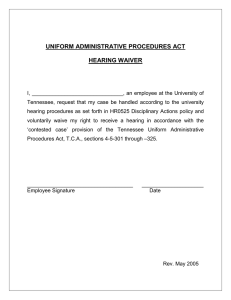 on the payroll, the exit audiogram can limit employer liability. a sound-treated room with acceptable ambient noise levels during testing. required from the person being tested. 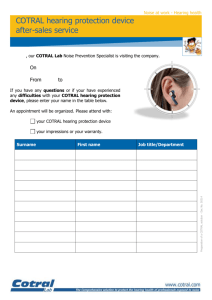 Occupational Hearing Conservation and any state requirements for audiometrists. should not exempt a technician from receiving training. 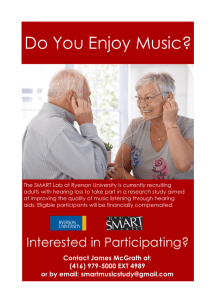 knowledgeable about hearing loss prevention. in the development, review, and approval of course work that leads to a recognized certification. renewed by taking a refresher course every five years. California, Indiana, New York, and Ohio have such requirements. offer speciality certification in occupational hearing loss prevention. may be inconsistent, frequency to frequency, ear to ear. the earphone cushion and eyeglasses and earrings need to be removed for testing. made in testing hearing, whether for occupational or clinical purposes. when the test is over. hold the button, the beeps will get fainter and fainter until you can no longer hear them. Please wait for me to remove the earphones when the test is over. interferes with testing should be referred for clinical testing. adequate time for the person to respond after a tone sequence is presented. helps to have the listener take a walk before retesting. hear signals at some frequencies at the maximum output levels of the audiometer. clinical a setting for a complete hearing test. 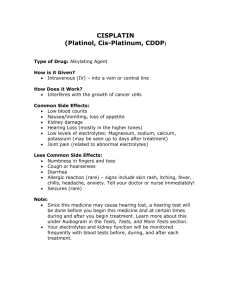 a reliable audiogram can’t be obtained, then referral for clinical testing may be necessary. to a clinical facility with a larger test booth may help alleviate claustrophobia. trying to hide a hearing loss as it is to find an employee trying to fake a hearing loss. 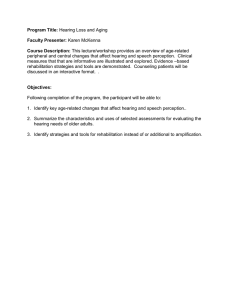 disruptive of group hearing testing environments. the employee at the end of the test. if possible as expected hearing levels vary by race. by the worker would be tested and recorded. due to middle ear disorders are protective against noise-induced hearing loss. may combine with noises at work to increase the employee’s daily noise burden. higher than for exposures to the agents alone (Morata and Franks 1996, 1997). the previous test, and whether any additional hearing protective actions need to be taken. told so and given positive reinforcement that present hearing protective measures are working. should be initiated with the informed worker as the centerpiece. the binaural average equal or exceed 25 dB HTL. infection, physical trauma, or familial tendency to develop early-onset age-related hearing loss. baseline hearing thresholds are at the upper boundary of normal hearing. 50 dB and should evoke the same subsequent actions. for when the interaural difference is sufficient to require referral for professional review. Figure 8.13. Maximum differences between ears for reliable air-conduction thresholds. a 4000-Hz notch, but normal hearing sensitivity, while the left ear shows a moderate highfrequency loss with 4000-Hz notch. apparent thresholds for the poorer ear actually represent crossover responses for the non-test ear. difference is 40 dB or more. are not trained to obtain masked thresholds. for the frequencies 2000, 3000, and 4000 Hz in either ear compared to the baseline audiogram. be used as the sole criteria for change sufficient to trigger referral to the reviewing professional. of asymmetry usually trigger a referral for clinical evaluation. threshold shift for the same ear and frequency, the shift is considered to be confirmed. shifts. Preventing temporary threshold shift prevents permanent threshold shifts. criteria for significant threshold shift were met again. continuous quality assurance, unreliable, unrepeatable audiograms become part of the record. with acceptance of the new audiogram once all changes in hearing have been assigned a reason. and have established steps to be taken in case of each of these. developing permanent threshold shifts and eventually handicapping noise-induced hearing loss. criteria for occupational hearing conservation programs. Washington, DC: AAO-HNS. ANSI S1.4-1983. Specifications for Sound Level Meters. ANSI S3.6-1996. Specifications for Audiometers. ANSI S3.21-1978 (R-1992). American National Standard for Manual Audiometry. Loss, Chernow Editorial Services, Inc., New York, NY. Instruments, 34(7) pp 10, 12, 13, and 39.
clinical audiometry. Ear Hear; 14(6):414-422. Frank T., Williams D.L. (1993b). Effects of background noise on earphone thresholds. J. Am. Miners, pp.1-7, and cover letter to Davitt McAteer, from Linda Rosenstock, August 6, 1996. Standards. Ear and Hearing, 13(1), 2-10. Franks J.R., Merry C.J., and Engel D.P. (1989). Noise Reducing Muffs for Audiometry. Program Data Base: Factors Other Than Workplace Noise. 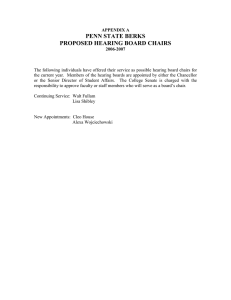 Ear and Hearing, 10(2), 273-280. Harris J.D. (1980). A Comparison of Computerized Audiometry by ANSI, Bekesy FixedFrequency, and Modified ISO Procedures. J. Aud. Res. 20, 143-167. Training of Industrial Audiometric Technicians. Am. Ind. Hyg. Assoc. J., 27, 303-304. Thresholds. J. Speech Hear. Res., 24, 330-345. Jerlvall L., Dryselius H. and Arlinger S. (1983). Comparison of Manual and ComputerControlled Audiometry. Scand. Audiol., 12, 209-213. Hearing Loss, Chernow Editorial Services, Inc, New York. three field studies. J. Acoust. Soc. Am., 101(5 part 2), 3099(a). Morrill J.C. (1986). 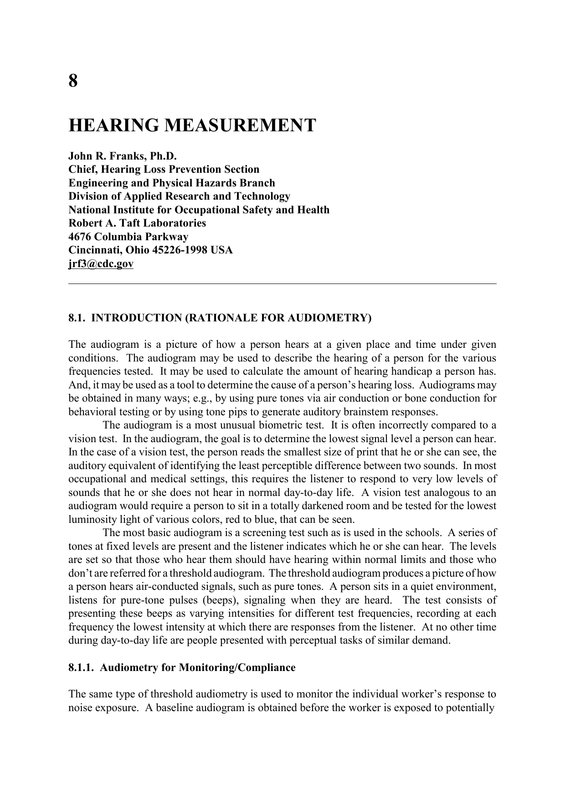 Hearing Measurement. In, E.H. Berger, W.D. Ward, J.C. Morrill, L.H. to Mobile Hearing Testing and Selecting a Provider. Milwaukee, Wisconsin. A Recommended Standard: Occupational Noise Exposure Revised Criteria. Cincinnati, Ohio. Hearing Conservation Amendment. Fed. Regist. 46(11), 4078-4181. Conservation Amendment. Fed. Regist. 48(46), 9738-9783. Windsor Locks, Connecticut. HETA 96-0184-2663. NIOSH, Cincinnati, Ohio. Martin, F.N. (1998). Exercises in Audiometry. Allyn & Bacon, Inc.